1. Infuses hair with a silky glossy finish. 2. Restores manageability, elasticity & condition of hair. 3. Reduces blow drying and styling time. Sounds like a dream come true right? I thought to myself "is this some kind of cruel bait-you-in tactic or is this for real?" The bottle says it can reduce drying time up to 50%. I am border line about ready to chop my hair off because of the time I spend daily drying it so I was anxious to see if that was true. I didn't time myself, but I definitely think it sped up the process! Woo-hoo! ...But the fabulousness doesn't end there! After blow-drying and straightening my hair I had that wonderful fresh hair cut feeling. My hair was shiny and smooth root to tip. 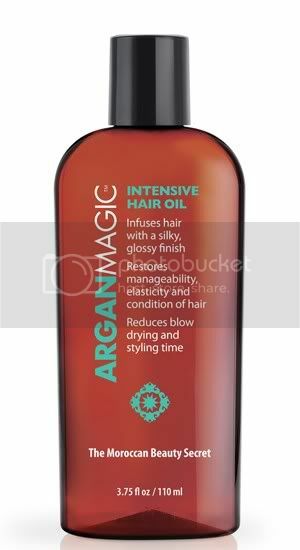 So, I can honestly say that the Argan Magic Intensive Hair Oil does do everything that it claims. This is a fantastic product and I recommend it to anyone who needs to re-vamp their hair routine. Now that I love this product I am curious about trying some other Argan Magic products...like the hair mask - perhaps!? I picked up my bottle at a local drugstore for around $10-$11 - which is a total steal. It's $18 on their website so if you decide to give this product a try, you might want to shop around first. Sounds great, Tiffany! I've been thinking about investing in Moroccan Hair Oil for a while, but I just can't get myself to lay out the cash! I'll have to check this out. I know we have pretty similiar 'wavy' hair, so I'm anxious to see if it will work for me too! Thank you! !